Flowers are a way of expressing feelings. Flowers are the most beautiful way to put things; it may be love or friendship. Different colours of flowers are used for different occasions to express different feelings. Red roses are used as an expression of love, while yellow, an expression of friendship. Let's look at the significance that other flowers carry around them. Let me talk about ‘Ambrosia'. This flower signifies that "your love is reciprocated". So, when someone proposes to you, and you want to tell the person that you are also in love with them, you can gift your to-be partner Ambrosia flowers. Another flower which is also equally interesting is ‘azalea' which is an expression of taking care of your loved one. Camellia, a flower with fragrance has many colors. The red color expresses that "you are the flame of my heart" and the white expresses "you are adorable". 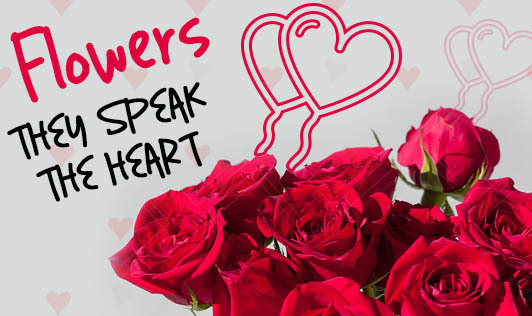 You can present these flowers to your friends, parents and heartthrobs too! The flower named Crocus represents "cheerfulness". You can gift this flower to the most cheerful person you have ever met. For a person whom you have to thank and express a sense of gratitude, you can gift them a daffodil. Roses are the most popular flowers of all times. The most interesting fact is roses are also of different kinds. Red roses say "I love you" Thorn fewer roses signify "love at first site", the Hibiscus rose describes a delicate beauty, while a white rose is a mark of innocence and purity. The use of white flowers to establish peace among countries is another example of the use of such flowers. Have you wondered if there are flowers that pass negative emotions too? The Crimson red rose represents "mourning", while the Marigold is a representation of jealousy, cruelty and grief, and the yellow Hyacinth for egotism! Isn't it quite surprising to know how flowers carry so much meaning in them? A flower speaks many languages. Choose the right flower to express the right feeling!